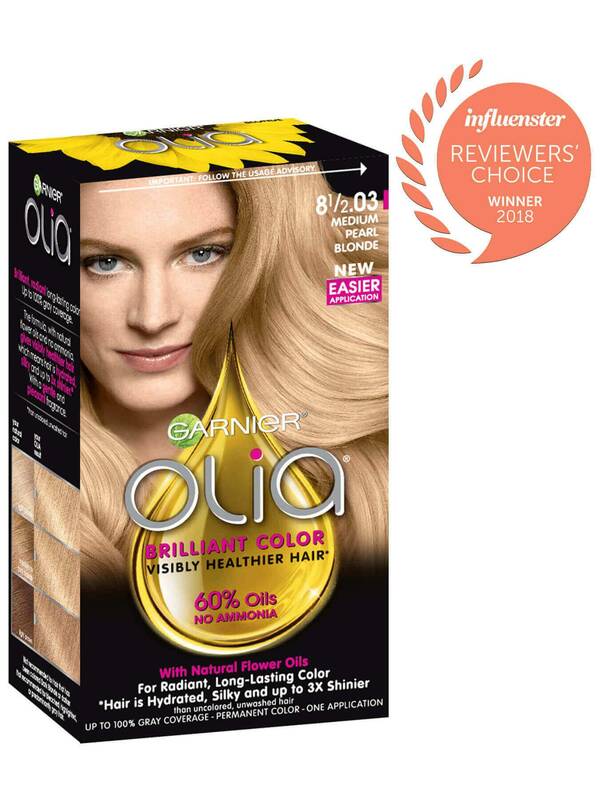 Garnier Olia shade 8 1/2.03, "Medium Pearl Blonde," was specially designed with a blend of both natural and golden tones to create a smooth transition with your natural hair as roots regrow. The color also brightens skintone and provides 100% gray coverage. It is best for anyone with natural hair between light blonde and light brown. If you would like a lighter shade that has this same effect, try shade 9.03. *For women with currently color treated hair, there are special considerations for the color result you can achieve. Because of this, we do not recommend shade 8 1/2.03 for hair that has been previously colored shade 6.0, "Light Brown," or darker. For more help, use our Shade Selector Tool to find the perfect shade for you! Rated 5 out of 5 by arlina25 from 8 1/2.3 I’m 45yrs old an have had blonde hair my entire life. I was born blonde,all my children are blonde. My roots started changing to dark brown in my 30s. I tried every brand out there. Every blonde. I could never find anything natural. Till I found 8 1/2.3 .. it’s the best color for a natural blonde you will find outside a salon. I recommend this 100%. I can no longer buy it near my home.online or nothing . I won’t ever buy another color or brand again . Great job Garnier!!! Rated 5 out of 5 by Nanne from Best bottle color out there I am 46 and have been coloring my hair since I was 15. That adds up to a LOT of experience with hair color. I have used all brands you can think of, drugstore color and professional. Cream and liquid. You name it, I have used it. Olia is hands down the best color I have ever used. The end result looks natural (obviously it all depends of your current color and hair texture, condition), hair is so smooth even though I retouch every other week, the blondes are shimmering (especially the "pearl" tones 8 1/2.03 and 9.03), clean, no brassiness, no oranges or yellows (again, it all depends of your current color and hair texture, condition). I see reviews here complaining that it left the hair dull, brittle etc. Honestly - and speaking out of experience - in those cases the hair must have endured some harsh chemical treatment or be unhealthy. This color does NOT damage hair. Rather the opposite. Please never discontinue the OLIA line! I would love to see more PEARL tones. Keep up the wonderful job, Garnier! 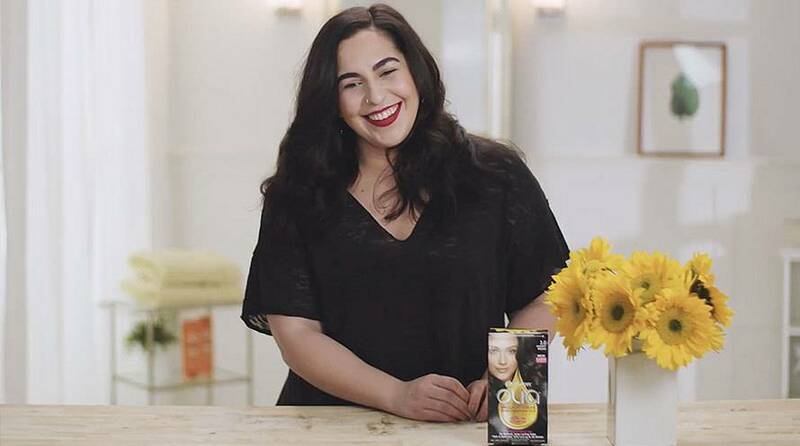 Rated 1 out of 5 by Mackville from Color is Too Golden - almost brassy This is my first use of Garnier Olia. I usually purchase a medium blonde shade in other brands and I bought Medium Pearl Blonde in the Olia. The color turned out to be too golden with some noticeable red. It's the wrong color for my skin tone and looks terrible on me. It's not my idea of a "medium blonde." They should call it golden blonde. I'm going to recolor as soon as possible, most likely with a different product. On the positive side, the color seemed to cover the gray well. Rated 5 out of 5 by Avalonmaid from Medium Pearl Blonde I bought this color in an attempt to add some spark to what had become a rather mousy blonde. LOVE IT!!! It added just enough umph to lighten my hair which now truly flatters my skin tone. There are high and low shades in my hair now that I had hoped a "pearl" would give! I really like this hair color brand. My hair looks more natural and feels so much more healthy after coloring. No icky smell and no itchy, burning scalp! Rated 5 out of 5 by Monicaxo from Beautiful Blonde I usually go with a platinum white blonde shade. I decided I wanted to go a more natural shade but scared to go too dark. Medium pearl blonde came out perfect and exceeded my expectations. It's not a dark blonde at all. It's still light with a natural buttery tone. Not brassy. Rated 2 out of 5 by qwertyasdfghjkl from Regrowth appears quickly. I've been using this dye for a few months now, and while I really enjoy it, I began to notice something: The regrowth with this product is very fast. Maybe that's just my experience and I left the dye on for too short of a time, but I'm not too pleased. That being said, this isn't my last time using the Garnier dyes, but I might switch to a different shade, because I find this isn't Medium Pearly, but a dark blonde. Dark a bit brassy. It's not that bothersome, but it's bothersome enough. I'm not disappointed in the product, just Meh on it. Rated 3 out of 5 by jerniegirl from Not for small hands At first glance, I liked the elegant rounded applicator bottle but, after using it for a minute or two realized that it was not practical for a woman with small hands (I wear a ring size 4.5). If my arthritis was flaring up, which thank goodness it wasn't, I would not have been able to use the bottle. Also, after 2 washings, my hair is somewhat dull and heavy. I can usually go 4 days or so between washings and I want to wash it daily now until it's back to normal. Not practical for my life to wash daily. I chose the lightest blonde shade my local Walgreens had and have only just now read the description of this color on the website. I would say their description is accurate but was not exactly what I wanted. My roots look pretty gold. I prefer a lighter color. Rated 5 out of 5 by KLSUGAR1024 from Best Color Ever!!! This is the best, most beautiful at home hair color I've ever used and believe me I've tried them all!! 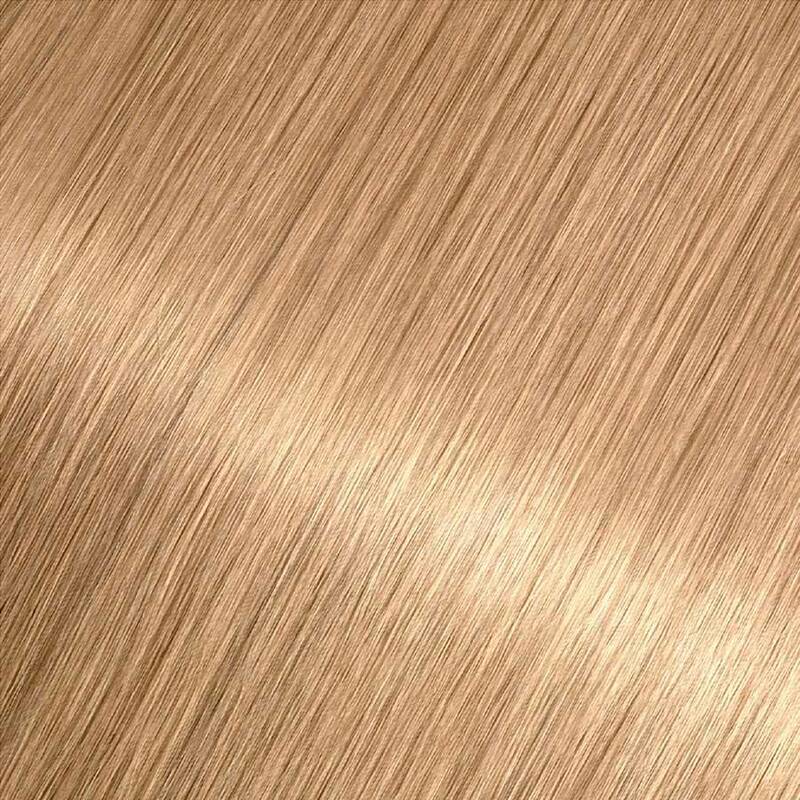 I am totally hooked, my hair looks so shiny and silky and a beautiful shimmering blonde! Gorgeous!! Thank you Garnier for making such a Wonderful Product!! !